PayPal Pro for WooCommerce allows you to take credit card details directly on your checkout page. 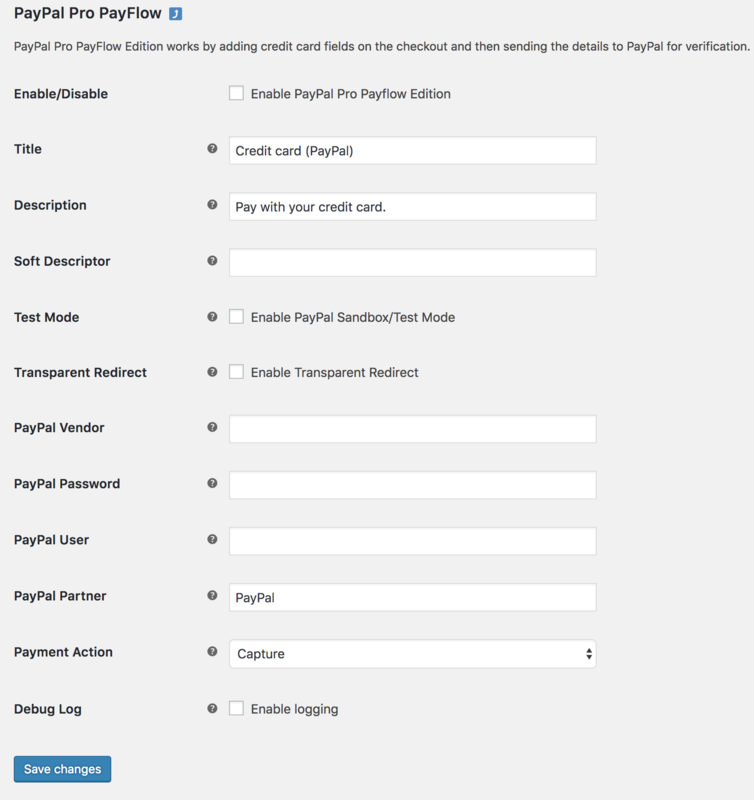 The PayPal Pro extension gives you access to two gateways: PayPal Pro (website payments pro) and PayPal Pro PayFlow. Both allow you to authorize and capture. For more info, see: PayPal Product Availability by Country. PayPal Pro is only available to holders of a PayPal Pro Business account. Authorizations are guaranteed for up to 3 days, though capture of authorizations can be attempted for up to 29 days. You cannot accept payments from customers in Russia if your Payflow Pro account is tied to a Website Payments Pro account. If you’re in the United States and concerned about PCI compliance, read: PCI-DSS Compliance and WooCommerce. Download the .zip file from your WooThemes account. Go to: WordPress Admin > Plugins > Add New to upload the file you downloaded with Choose File. Note: PayPal requires an SSL certificate, so be sure to tick the Force Secure Checkout checkbox at: WooCommerce > Settings > Checkout. PayPal Pro requires that you have a PayPal Pro business account. You can sign up for one at the PayPal website. Be aware that you incur a monthly fee. Once you have the correct type of account, you will receive API credentials. Go to: WooCommerce > Settings > Payments. Note: ‘Payments’ formerly called ‘Checkout’ prior to WooCommerce 3.4. Select PayPal Pro. This takes you to the Settings screen. Enable/Disable – Enable to use. Disable to turn off. Send Item Details – Checkbox should be ticked. Disable if you experience rounding errors. In the UK, 3-D Secure is required to accept Maestro credit cards and can also help prevent chargebacks. To learn more, see: PayPal UK Security. To test 3-D Secure with PayPal sandbox, use a credit card from one of your test sandbox buyer accounts and then, depending on the outcome you wish to simulate, choose the expiry date during checkout. For example, if you use a PayPal sandbox card number 45678xxxxxxx0002 but the Expiry Date 01/2013, you will generate the Fully Authenticated Test case with 3D Secure, and still reach the PayPal gateway for the authorization. To learn more about 3-D Secure and test cases, see: Implementing 3-D Secure Transactions (UK). PayPal Pro PayFlow requires that have a PayPal Pro business account. You can sign up for one at the PayPal website. Be aware that you incur a monthly fee. Select PayPal Pro PayFlow. This takes you to the Settings screen. 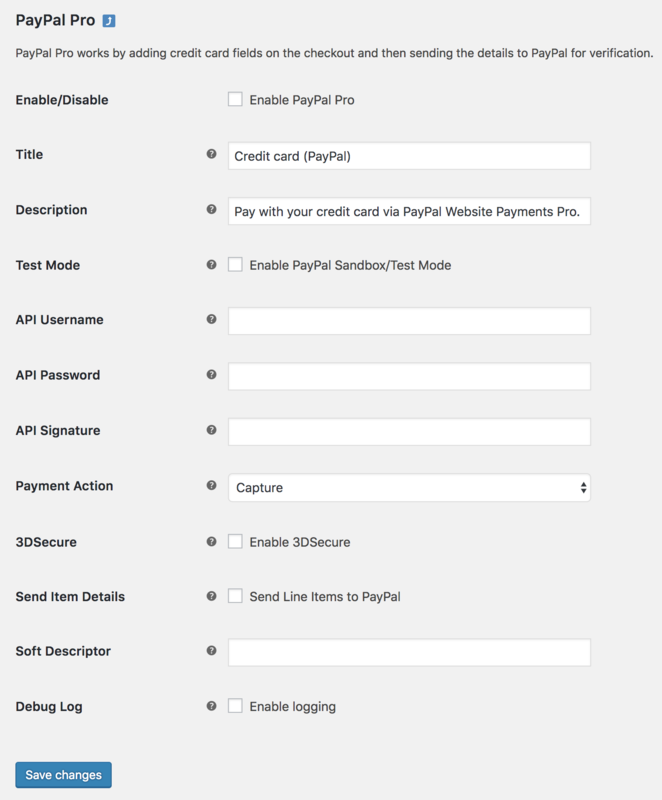 Test Mode – Enable PayPal Sandbox for testing. Remember to untick box to go live. Debug Log – Tick checkbox to enable/disable for troubleshooting purposes. Otherwise leave disabled. Use a Developer account to log into the PayPal Developer website. You can also use the buyer account in Sandbox, and use test credit cards during checkout. You cannot use live API details with Sandbox. PayPal Pro in Australia is not the same as PayPal Pro in the the US/Canada/UK, so this extension will not work with a PayPal Pro Australia account. HOWEVER, you can set up a PayFlow account in Australia, and PayPal will link that with your PayPal account and you can use that with this extension. The icon used is filterable by adding code to your theme functions.php file. Replace the image URL as follows. Ensure to link your icon via https to keep the connection secure. Address verification is done on the PayPal side. If address verification fails, the order is put On Hold. No, PayPal Pro does not support recurring billing at this time. PayPal Pro generates unique transaction IDs for the authorization and the capture. This means that while the authorization ID is made available as soon as you authorize, the capture ID is not available until the funds are captured. Consider changing the privilege role for your PayPal user from API_FULL_TRANSACTIONS to ADMIN_TRANSACTIONS. Log in to your PayPal Manager account. Enter your Partner, Merchant Login and Password information, then click Log In. Under Manage Users you can then edit privilege levels. For more information on predefined roles, see About User Privilege Levels. Have a question before you buy? Please fill out this pre-sales form. Already purchased and need some assistance? Get in touch with a Happiness Engineer via the Help Desk. Can I use PayPal Pro in Australia? Can I change the credit card icons? How do I enable address verification? Is this compatible with WooCommerce Subscriptions? What is the transaction ID? Receiving “PayPal Express Checkout is not setup on this account”?